Leave your funniest clean caption to the photo in the comments section below. We reserve the right to delete captions that we deem inappropriate. We’re not too stingy, but try to keep it moderately PG-13. Captions submitted any other way besides in the comment section will not be accepted! That means do not use the feedback form! Captions will be accepted from the moment this post goes live until Friday, May 22nd at 10 a.m. Mountain Time. A crack team of humor experts will pick the winner and we will announce it next week. Get to it! This time around, the prize is two of our favorite new products - a handsome, shiny FreeSoC2 and a special Anouk edition Pink Teensy! New Product Friday: Free Socks! Casey learns he is actually Canadian.
" Become an Electronics engineer, they said. It will be fun, they said"
Forget Watergate, this is NAND gate. Don't mess with FPGAs â the Fierce Programmer Geeks of America. What do you mean my Captain America Underoos were back-ordered?!?! How dare you! My office isn't messy, I have a system you know. Hello, Joshua. Let's play Global Thermonuclear War. But there is no joy in Mudville â mighty Casey has struck out. Happy?! What's there to be happy about... It's my Pink Teensy they're giving away! After Skynet took over Casey was Humanity's last chance. Every Spark Fun employees biggest fear, the moment they see their picture on the monthly caption contest. Some assembly require, they said SOME assembly required. I'll show them SOME assembly. Captain America knew he would need an ally that could match Tony Stark in the Civil War. This was not what he had in mind. The same thing we do every night, Pinky, try to take over the world. The Arduino v. Arduino SRL saga brings many tears. In denial Casey types "Adafruit" into the browser. "Could not load OpenGL subsystem"
A day in the life of Capstan AmeriCode. America: keeping electrons free since 1776. Textbook desk of a great Engineer. Casey responds positively to the news that Arduinos will soon be manufactured right here in Amer'ca! The same thing we do every night, Casey. Try and take over the world! Memorial Day in the age of IoT: Free to make thanks to those who served. Trusting no one, Molder searches for Sulley's files on the X:drive. As everyone knows, there is no X:drive. So that's why the stepper drivers are out of stock. Someone tell Casey that stepper motors can't fly. This stuff is like crack!!! Speaking of crack... mine feels a bit drafty... (zoom in!!). Casey didn't know why, but he always got the feeling that the US government was looking over his shoulder. When they told Casey to represent his country; be brought out FreeSoc's, EagleCAD, and a SolidWorks attitude. The moment when you realize that the huge american flag you've cherished for so long has the incorrect number of stars on it. After another fight with his mom, Casey soothes his soul in her basement. I'll die a thousand deaths before I let you vacuum my room, Mom. "The Hunt for Bin Laden - Behind The Scenes"
Mighty Casey at the hack, who needs an organizing rack. Settled in his patriotic home, trying to assemble his flying drone. But he's depressed as you can see, because his drone is banned at the SP AVC. I don't have to clean up my room mom!!! THIS IS 'MURICA!!! Casey is so well organised he keeps track of all his stuff on a database on his computer. Casey is still depressed after his tragic defeat in The Actobotics Challenge. Sometimes you are positive that you have an original idea, but then you look on Alibaba and someone else is already selling a Raspberry Pi based Badger Racing Simulator. And their's only costs $50. One of those people who cant clean up until after they finish a project but start more projects than they finish. After Casey's desk was moved into the supply closet, he could be heard to be muttering something about his missing red Swingline stapler. Casey writing a stern email regarding the self assembly robot just "sitting" in the corner. Casey bidding on vibranium to finish his latest project. I'll show them... you can do anything with emacs! Casey got the wrong idea when he heard about the FreeSoC2's ability to configure hardware! I told them Windows 10 to control a 3D printer was a bad idea! "I will make these Actobotics parts as aerodynamic as any of the planes on the wallâ¦ even if it takes me a thousand CFD simulations!" Casey is quite frustrated to learn that his "electric freedom blasters" (shown leaning in the corner) have been rejected by the military. I may be living in my Mom's basement, but it's a G----n American basement! The home of the free and now the FreeSoC2, does it get any better than this? "Dear Mom, I think I left Fluffy Buns under my pillow when I slept over last night. Could you please check my old room and ...."
I've got a pile O' Scrap, and the Internetz....the world is MINE! Cubicle dweller, circa 2020. Seen in his native habitat, surrounded by fetish objects, this individual is attempting to communicate with one of his technology gods, perhaps the Great SporkPhun himself. Filthy maggot puke ISPs are suing to overturn new net neutrality rules in this great country.......Figures.
" The new Sparkun HARDuno PEASHOOTER project was taking a bit longer than initially expected"
Until Casey obtains enough Actobotics c-channel to complete his operational B-25 Mitchell replica, he will have to get by on Microsoft Flight Simulator. Instead of taking the electronics market by storm, Casey is unfortunately confined to his desk for the day. Every American has certain unalienable rights, such as, the pursuit of happiness (meaning freedom to purchase FreeSoC). With his failed erector set based missile defense system tossed aside, Casey searched desperately for a project patriotic enough to impress his new special ops online girlfriend. Two hours preparing for this dungeon raid ruined. I hate you Leroy Jenkins! Captain America off duty...or trying to stay off duty. "they need me out there"
I'm too much of a manly American to demo that new pinko commie Teensy! Hmph! Hard drive not found.. Oh, S***! Scorned and rejected by those around him Casey gives up on his request for a storage rack. Like so many of us, Casey didn't win anything in Dumpster Dive Dos... Sad, Sad, Sad. And now, Casey stares his computer into submission, all while eating a 1 lb. bacon burger. Finally! Someone with a workbench more organized than mine. Location: Sparkfun USA. Area: The old Pig Place Prototype Area. I know I just hit submit to have my pizza delivered. "No dumb battlebot ever won a war by going out and dying for his team. He won it by making some other dumb battlebot die for their team." His face is saying, "No, I'm totally serious about my work". His eyes are saying I haven't had this much fun in weeks and I am holding back a smile. when you upgrade from a cubicle to a office space and don't know how to organize your stuff: look on the internet at the unappealing suggestions. "'Nuclear launch detected'. 'NOOOOOOOOOOO!!!!!!!!!!!! "I guess I will have to get back to work now!" The great grandson of Dr. Loveless working on the next mechanical spider. Casey the Coder says, "We can do IT!" The "red box"... I know it is there, but I will not look at the "red box". I cannot think of the "red box". Just like I cannot think of the "the game"... Damn it! I lost the game again! Damn you "red box"! "I can't stand unpatriotic code." And here we have Bob. He has been working here for 6 months and the only thing he ever types in his emails is: "Hodor". Super drone? I am not building a super drone, who said anything about a super drone? 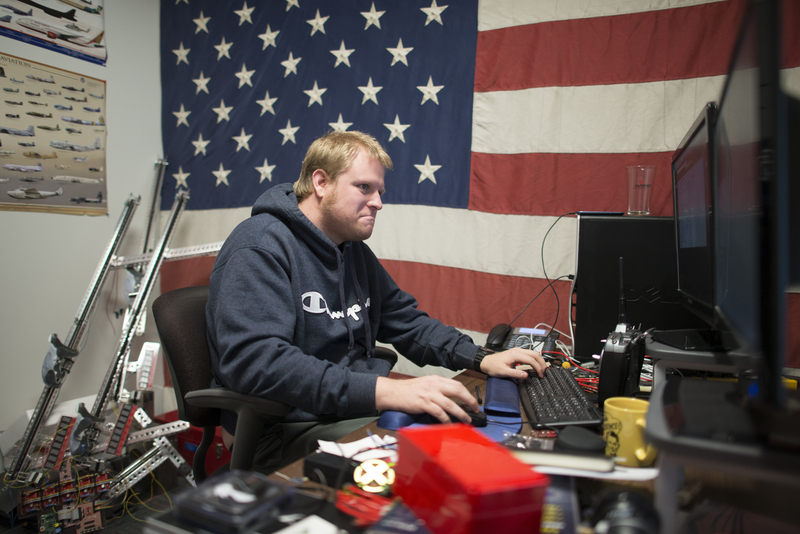 The illegitimate son of Lady Ada and Duke Nukem gets an intern position at Sparkfun. Deep code, by "Hack" Jandey. Casey on the verge of creating a breakthrough smirking emoji. After being told by his mommy that he couldn't get the new FreeSoC2 for his battlebot, Casey retreats to his room in the basement to pout. I'm gonna pour some freedom into those orders! Just another day at Avengers operations division with Captain Coder. The guy who bought Microsoft BOB. "With my Raspberry pi-based rail gun, I will stop, the world...I will stop, the pain." After failing to come up with a suitable air-to-air defense system, he's be relegated to a hidden corner of the DOD to while away his employment til retirement. I'll give you this keyboard when you pry it from my cold, dead hands. They have a cave troll, said Boromir and started to barricade the door. The Infamous Hacker-Drone builder proudly posted images of all the enemy aircraft his drones had shot down on the wall behind him. DANG!!! "Iron Man" and "Captain America" have been taken. Why aren't there any open source super hero names! Curse you evil copyright system!!! Holy cow there it is "HELLO WORLD", Mom's gonna be so proud!!! the sheer horror of realizing you haven't saved in hours right after getting "eagle.exe has stopped working, Windows will never find a solution." That's the look you have when you are trying to decipher a picture on Spark Fun's website to win a CAPTION contest!! Pay no attention to that man behind the flag! Come on! There must be somebody selling a bigger flag on eBay. The only easy day hacking, is yesterday. Here is a rare glimpse of what it actually looks like inside DARPA. International standards? I only have time for 'merican standards! Captain Sparkfun - defender of the makers! Friday Product Post: Ohhh! What Does This Button Do?